ChemWorld is a distributor of Propylene Glycol USP. Water Treatment equipment for cooling towers. ChemWorld provides free training material. Does ChemWorld sell Propylene Glycol USP? Yes, ChemWorld sells 1, 5, and 55 gallon containers of USP grade Propylene Glycol. These products are final packaged in USP certified packaging and manufacturing facilities. Can we order USP Glycol? ChemWorld sells direct to everyone. 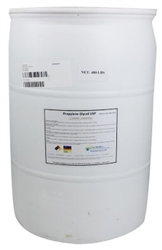 We are a direct distributor of USP Propylene Glycol. All products drop ship from Atlanta, Georgia. Dowfrost is a trademark of Dow. What is Dowfrost?Dowfrost is a DPK corrosion inhibited Propylene Glycol blend approved for use in food and beverage facilities where incidental food contact may occur. Dowfrost is not formulated for direct food and beverage applications. Where can I buy Dowfrost?ChemWorld is a stocking distributor of Dowfrost and Dowfrost HD. ChemWorld sells direct to everyone. Products are stocked and ships daily from Atlanta. What is Inhibited Propylene Glycol? Inhibited Propylene Glycol is a corrosion inhibited product designed to minimize corrosion within water systems. Dowfrost is the most popular blend of inhibited glycol for food regulated facilities. ChemWorld formulates an organic corrosion inhibited glycol system for non food and beverage facilities. How do I order Propylene Glycol?ChemWorld ships Propylene Glycol daily from Atlanta with all 48 states for free. Simply order online and we will ship your product ASAP. Propylene Glycol is used in many applications. Check out our MSDS and COA for more product information about Propylene Glycol. Where does USP Glycol ship from?ChemWorld ships USP Propylene Glycol daily from the SE USA (Atlanta and Houston). Simply order online. We sell direct to everyone. What is Food Grade Propylene Glycol? USP Grade Propylene Glycol is considered a glycol that is approved for direct use in small amounts within food and beverages. Please consult an expert food consultant before using USP glycol within food. What is Premixed Glycol? Premixed Propylene Glycol Solutions are mixed ready to use. Simply add direct to the water system. What freeze protect is glycol used at? The most popular blends are 40 and 50% solutions. Check out our glycol freeze protection chart located on the left navigation.